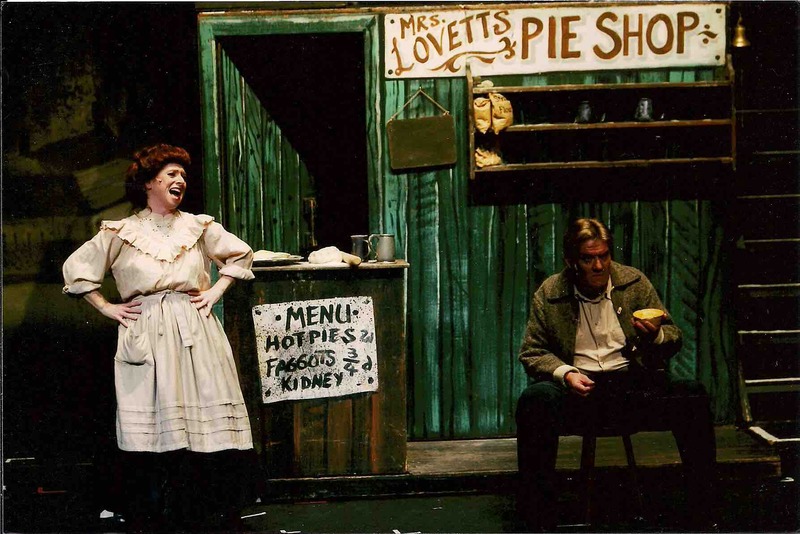 Sondheim’s Sweeney Todd was never going to be an easy show to sell. 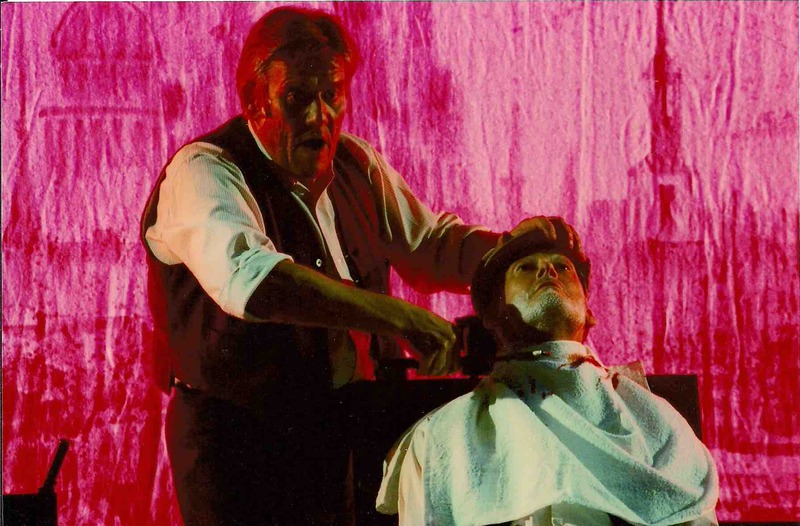 It was a relatively unknown musical and the storyline, involving a barber who cuts the throats of his customers before his accomplice turns the bodies into meat pies (albeit tasty ones! ), was not one to attract the usual SOS audience members. 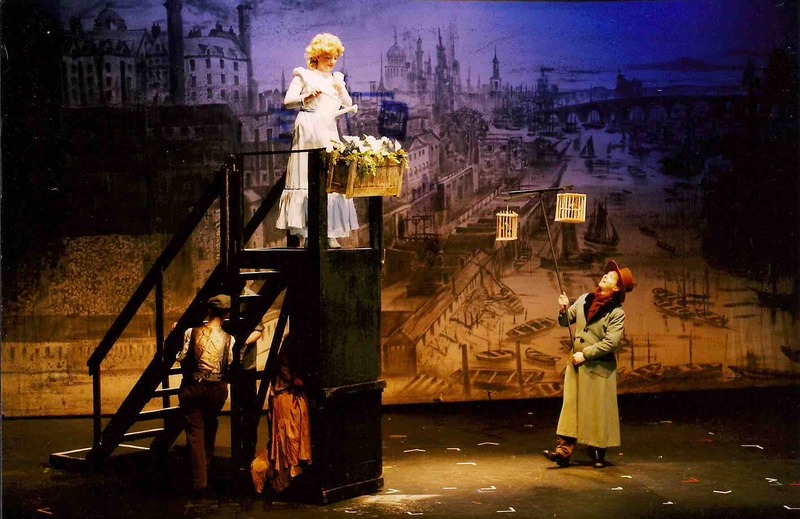 However, the Society was fortunate to have the input of Malcolm Clarke from RAODS as Director and Martin Paterson as MD - both were very enthusiastic about the show and the small cast of 27 found rehearsals to be demanding and thoroughly enjoyable. 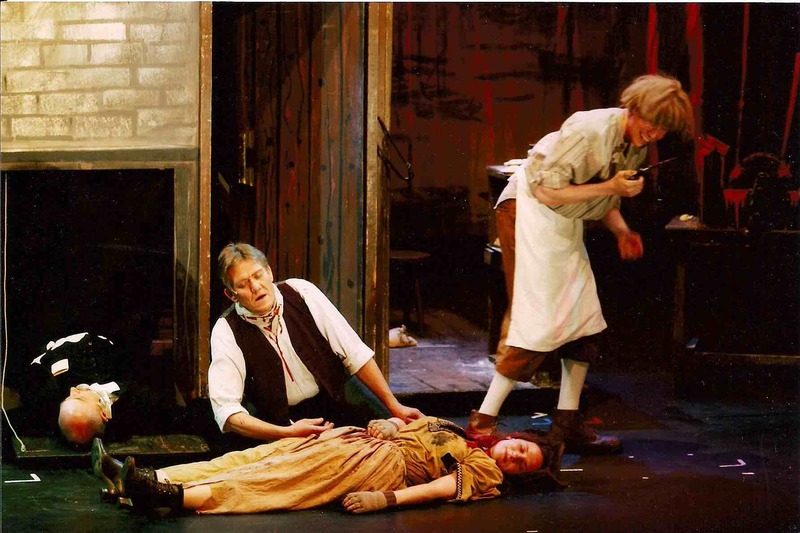 Sweeney Todd was a very technical show and caused far more backstage problems than usual. The set was hired and duly arrived on the Sunday morning but without the expert who was supposed to advise on its erection (he had been replaced by a CD) and was also missing several essential parts. Ralph Bateman spent much of the day making sections, repairing others and generally ensuring that it was safe enough to use. 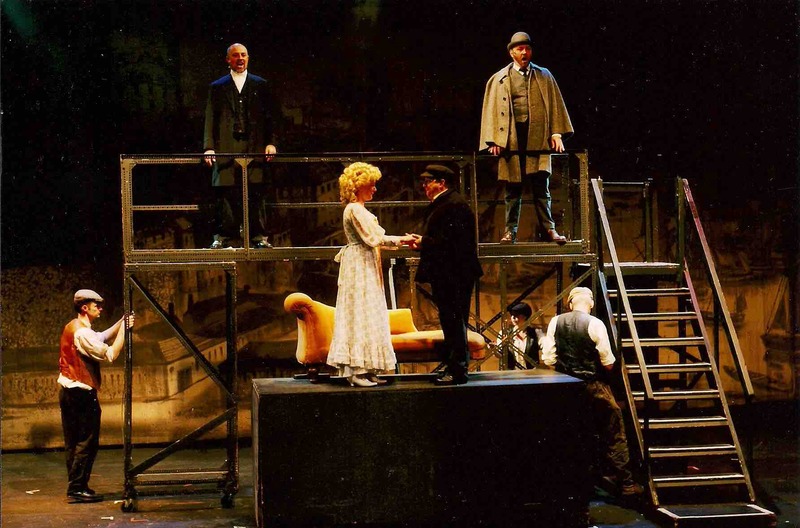 The next problem was that, when not in use on stage, it was too big to fit in the wings of the theatre and much of the Nuffield’s clutter had to be rearranged. The Technical Rehearsal was most probably the longest on record. The complicated walkway system used by Anthony (Ralph Bateman) for his entrance took a long time to perfect, the revolving of the heavy main section to represent the various scenes proved difficult for the crew to move and the use of the trap door and chute for disposing of the many ‘dead’ bodies needed a lot of practice. The evening ended with just Act 1 completed! The Dress Rehearsal therefore, had to start with a Tech for the Finale of Act 2 (which involved more carnage) so a complete run through was not possible. At this stage, Malcolm wanted to cancel the opening night and hold a proper Dress Rehearsal instead but, with tickets already sold, this was not feasible. He did, however, spend the next day in the theatre with Phil Moody perfecting the lighting. 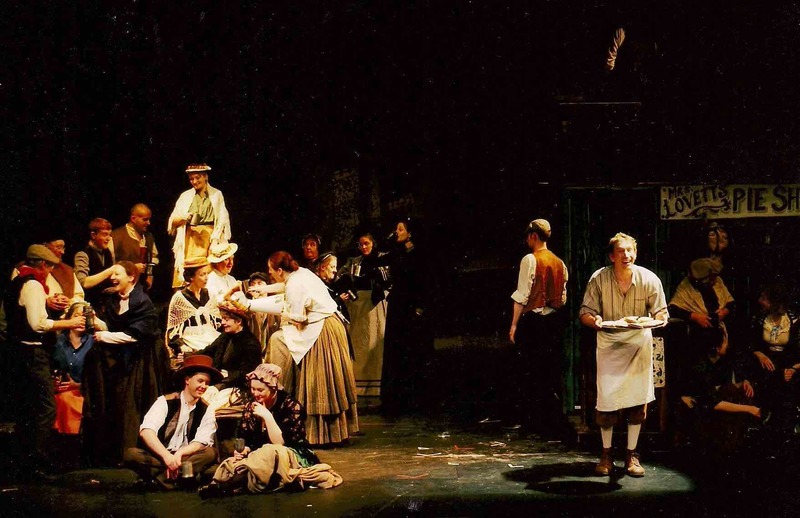 Ticket sales were very low but the Committee was not to know that a major film of Sweeney Todd (starring Johnny Depp and Helena Bonham Carter) was under production - if it had waited a year or two then the significant loss on this project (£6957) might not have happened. 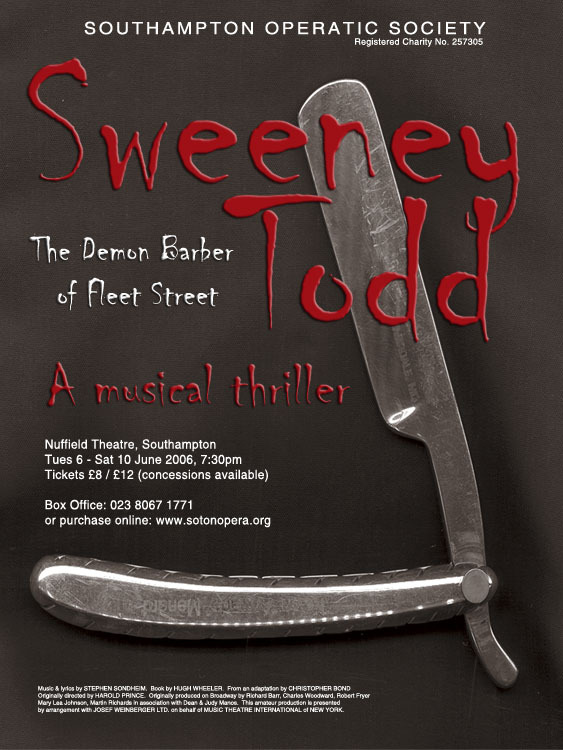 Peter Barber (Sweeney Todd) - The Demon Barber of Fleet Street!